I’ve wanted a dog my whole life and now I’m the happiest man alive. Reddit say hi to Caesar! Hail, Caesar! That pupper is gonna rule! He already rules our household! Walk him and play fetch with him often. I love my Shepard, but she can get very destructive when she doesn't have an outlet for all that awesome Shepard energy. Seconding this advice. Also get some Kongs/treat puzzles to keep them mentally stimulated during down time. They’re smart dogs, so they’ll get themselves into trouble if they get too bored! Source: have a border collie, king shepherd mix. Shepards do best when they regularly visit their favorite shops on the Citadel. He is a handsome guy! He looks like he's ready to cross the Rubicon! Fun fact: Caesar never said "et tu, Brute?" It was Shakespeare! Of course he never said it. Dogs can't talk. Maybe yours can’t. Mine just happens to have some really interesting opinions on multiculturalism. "Go back to ya own kennel ya flog" - Bogan dog. "Breaking up ethnic enclaves leads to unforeseen side-effects and may harm the ability for first- and second-generation immigrants to assimilate properly into the host culture of their countries." Damn it i wanted to say that. I love your dog, BTW. He looks like a proud pup. Also big RIP for our b0i. He ruined our salad. Thank you! He is a very confident and handsome little boy!! What a beautiful pup! I’m sure you’re well prepared, but for all those reading, German shepherds are a tough breed and need tons of socialization and positive reinforcement training. If you’re thinking about getting a pup, check out /r/puppy101 for helpful tips and occasionally a group to commiserate with! Great name! Train him well! Too many people waste working dog’s potential. I’ve already started basic training and oh my god he learns so fast!! Amazingly intelligent breed. Keep up the training, give him all of your time! Hell yeah they do! They’re so dang smart you can teach them so much, even when they’re puppies. Just get their attention, and your off! He knows hes a "CEASAR"! Nice looking puppy!! 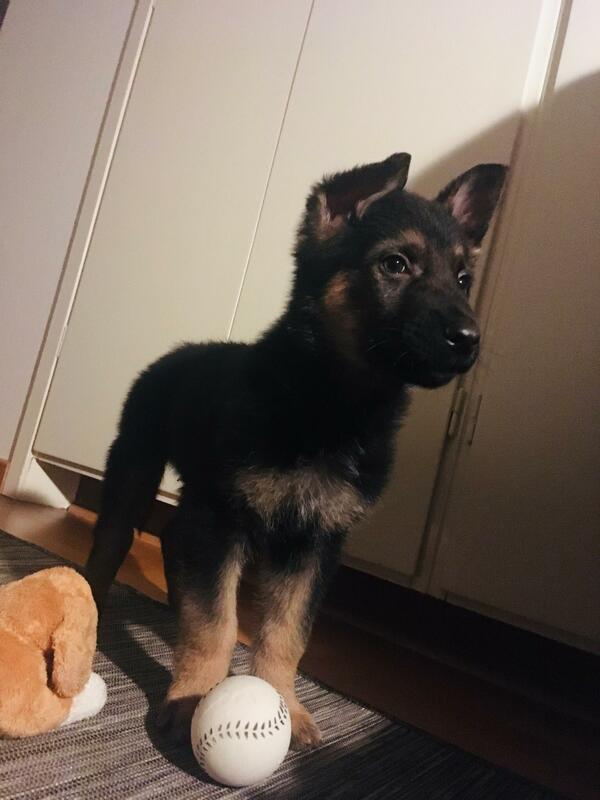 German Shepherd? Last year I bought a 7 week old golden retriever/ GS Mix and named him “Chief” lol.. he is awesome and is my life.. Congrats mate! I had a golden GS mix for 14 years Best dog ever. I still miss her 7 years later. Great pups. Literally this is my dream. Great name by the way. I feel you, it’s impossible not to fall in love with these little guys. Thanks, it was my dad’a suggestion! What out for rocks tho, I don't want anything bad happening to him. Oh god why does he eat so many rocks!!? It'll stop. Just be patient. I have a 2yr old GSD. He's the best creature on this planet. But there were some tough spots along the way, eg...rock eating. Looking back all the "tough spots" were just standard stages of maturation. STAY CONSISTENT ON TRAINING!!!!! It's working even if it doesn't always feel like it. And it doesn't have to be crazy in depth stuff, just consistency. They are absolutely amazing partners, you're lucky. I'd consider my training a success, I'd be happy to share any of my anecdotes of you're looking for any insight/tips. I dont really plan on having a pet when I move out, but I upvoted because I seriously vibe with you anyways. I currently have to share a crappy PC with my dad (I'll leave it at this but he misunderstands a lot about computers and this leads to some interesting issues, I love him though lol) but I cant wait for the day when I can drop some serious money on a gaming rig of my own - that I dont have to share. So here's to finally fulfilling our childhood dreams, and I'm glad you were finally able to fulfill yours. Wish you all the best, man! One day it’ll, you know it! I am commander Shepard, and this is my favorite comment. Render unto Caesar what is Caesar's! This includes but is not limited to: treats, kibbles, snoot boops, your slippers, and most of the space on the bed. Congratulations! I'm hoping to see more of him in the future, he's beautiful. Hope you will have a splendid time together! Awww. When I was a kid, our family had a German Shepherd named Caesar. He was the goodest boy. Damn I miss that dog. The dog looks like he’s wanted a human his entire life and now he’s the proudest dog alive cuz his dog friends said he’ll never be as good as them since he don’t have a human. Hi puppy! You will have the best life with your peoples! Grow up big and keep them safe! Soooo fluffy!!! He looks like the optimal cuddler ❤ congrats! Hello! He’s such a cute puppy! Are you kidding me D; those ears! Those dark colors! Hello little man. 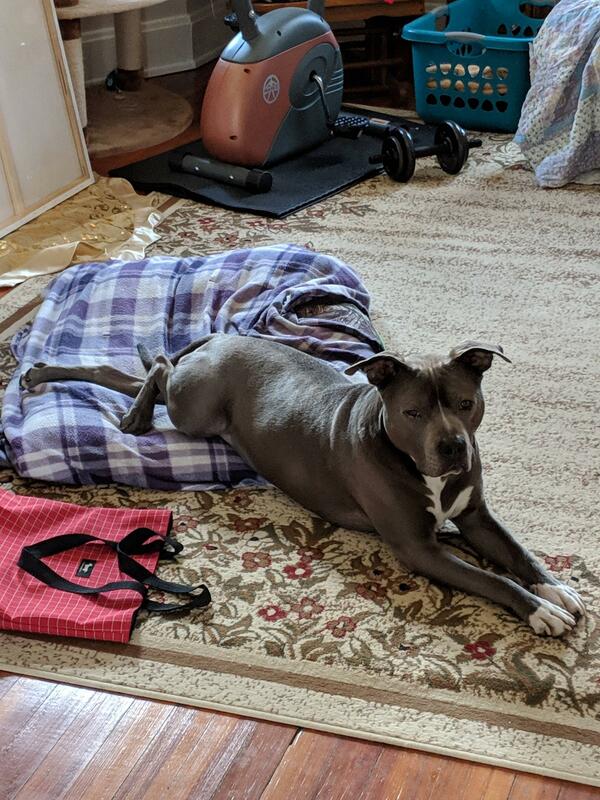 You are going to have so much fun in your new home with your new person! It's a great looking dog, give him a pet for me! He cannot wait for your command! Don't let him meet someone named Brutus. Et tu Brute? YYYEEESSSSS!!!!!! My doggies name is caesar salad! i'll let you in on a little tip OP. german shepherds love ear rubs. Good luck, he’s gonna be a handful! Hey Caesar, where’s Ranch ?? And his name shall be Caeser, and he shall be called wonderful. Best friend you’ll ever have, just wait and Caesar. I had a Doberman as a kid and he was called Caesar. I loved that pup. Hi Caesar! Such a cutie! Ave, Caesar, memeturi te salutant! What a gorgeous puppy. Hail Caesar! Will Caesar get crushed by a stone ? Do you happen to be a Fallout fan? Now i'm not saying it's impossible that OP got the name or inspiration for the name from Fallout, but it is highly unlikely. I'm just saying that because of their affinity towards dogs. Wow, surprised it's not a pitbull. Reddit loves pitbulls for some reason. I'm sorry to say this, but that adorable little pupper is gonna get stabbed in the back one day. Man....it's been my childhood dream to have a cat. Maybe one day. From a private breeder of German Shepherds! What breed is that? I’m going to buy a dog soon. Talk to your vet about having his stomach tacked when you neuter him, I'm so glad I did this with my GSD. Easy, laparoscopic, no worries about bloat. Highly recommend. Should call him Kaiser since that’s Caesar in German. Beautiful boy, congrats. I've had two German Shepards in my life. Fantastic, loyal dogs. Very strong willed though. The most important things to know with this breed is to socialise them early and lots, with humans and other animals so that they don't become aggressive, and they HAVE to be well trained, they suffer from selective hearing. They will kill small fluffy animals unless they grow up with them, so if you want a cat, now is the time to get one. I hope you have some weight behind you. One of my boys grew to 55kg and was as tall as me when he stood. He was able to pull my 100kg body with no trouble at all. Overall they're a great breed, very protective and affectionate. Just keep him away from the kitchen knives. 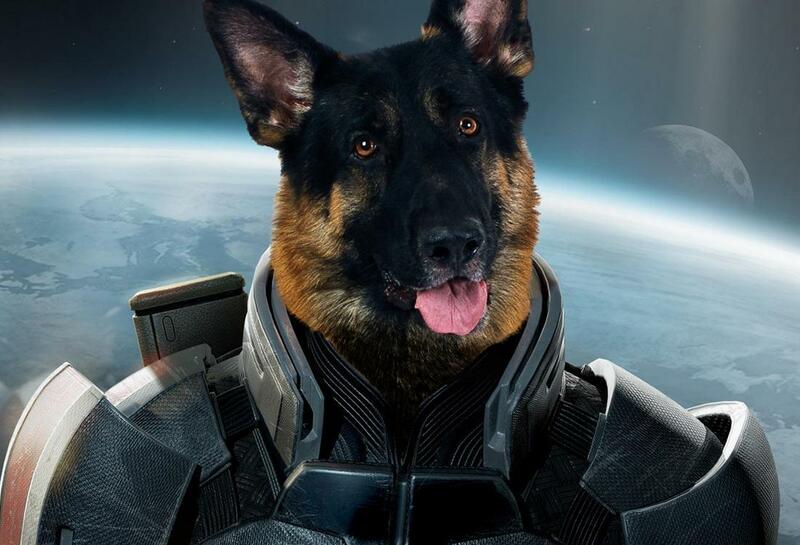 Enjoy, GSDs are such a great breed. I literally just got the same dog and the same coat how weird!!!!!! Ceaser was the name of my first dog. He was also brown. He was the best. I hope he gets dumb cute nicknames like Ceasy. So you can tell him to “take it easy Ceasy” when you go to work. Your world has been improved exponentially. Dogs are the best part of life!